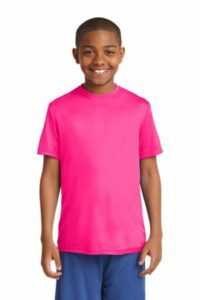 ORDER YOUR PINKATHON GEAR BY 10/8/18 at Noon! The Deadline to Pre-Order and Pre-Pay for Pinkathon T-shirts has past. A limited number of shirts and sizes will be available for purchase at the event for $5 more per shirt than the Pre-Order prices. Please arrive early if you want to buy a t-shirt that’s in your size – they will go fast! 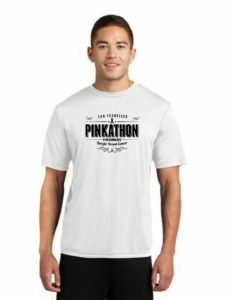 Pinkathon T-shirts and gear must be pre-ordered and paid separately from your Registration and Donations. T-shirts payments do not qualify as donations to the charity. We only make enough t-shirts to cover the orders and extras for volunteers. Important: All shirts and gear must be pre-ordered and pre-paid if you want a guaranteed shirt in your size at the best price. Very few extra shirts will be available for purchase (cash or check only) on race day, for $5 more per shirt than orders that were pre-paid before the deadline. We cannot afford to order too many extras. Mens short sleeve Tech T – White w/black logo – $20 pre-pay, not available at event. Pinkathon Short-Sleeve Tech Tees and Tank Tees are $20 each. 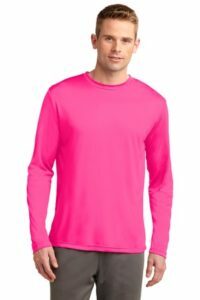 Long Sleeve Tech Tees are $25. 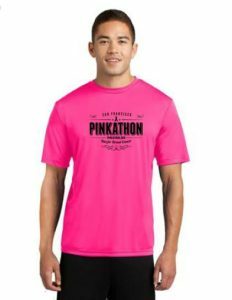 ALL t-shirts have the Pinkathon Logo in black on the front. Pink Racing Hats with NO LOGO are $10. All gear must be pre-ordered and pre-paid using the form below. Deadline to Pre-Order and Pre-Pay is 10/8/18 at Noon. Your shirts will be available for pick-up @7 days before the event, or you can pick up at the event on 10/27/18. Please use the form below to order, and we will email you with information on how to pay AFTER we receive your order. We will accept debit card payments using PayPal (click on http://www.paypal.me/elholbrook/ and select “Friends & Family” – NOT Goods/Services), Checks and Cash (only an option if you will see Ellen in person before 10/8/18). Razorback Tank T’s are only available in Neon Pink and only in Womens sizes. They are not available in Mens sizes. They cost the same as regular T-Shirts. They are made out of the exact same material. 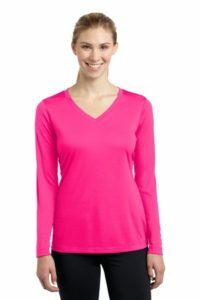 Women’s Long Sleeve T’s are V-neck only. Round necks are not available. Checks or Cash (only if you will see Ellen by 10/8/18). Can I purchase a T-shirt on Race-Day? 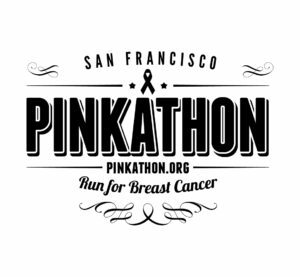 Anticipating last-minute interest, we will have a small number of extra Pinkathon Tee-Shirts available for purchase on the morning of the race/run for $30 each (CASH ONLY!) Unless you pre-order and pre-pay, your size may not be available on race day, but make sure to bring some extra cash just in case. Sorry, we CANNOT accept credit cards on race day. PRE-ORDER USING THE FORM BELOW – SCROLL DOWN TO BOTTOM. PAYMENT HAPPENS AFTER. After we receive your order request, we will email you back with more details about how to complete your payment. For instance, if you are paying by check, I will email you my address. If you are paying with PayPal, will will send you the email address to complete the payment. If you are using SquareCash*, I will email you the payment request. If there are any excess funds, they will be donated to The Breast Cancer Research Fund. Your T-shirt payments do NOT qualify as tax-deductible donations, because you are receiving goods for purchase. PICKUP: We will be bringing the tee-shirts to the START of the Pinkathon 10/27/18. To keep costs and admin hassles low, we will NOT send/ship tees to anyone. AFTER you submit your order, we will email you back with info about how to pay. 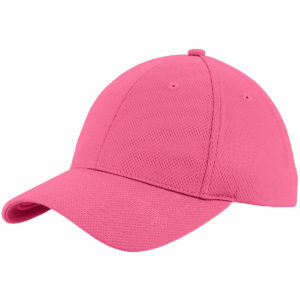 Do you want a Pink Cap (one size, no logo) for $10 each? Yes, We will assume 1 cap, unless you specify more in Message box on bottom. Debit Card via PayPal - https://www.paypal.me/elholbrook/ and select “Friends & Family” - do NOT select paying for "Goods & Services"
I will send Ellen a Check no later than 9/23 so that it will arrive before 10/1/18. I will see Ellen before 10/1/18 and give her cash or a check made out to Ellen Holbrook. Your Message or Questions? Also indicate quantities if ordering multiple items.